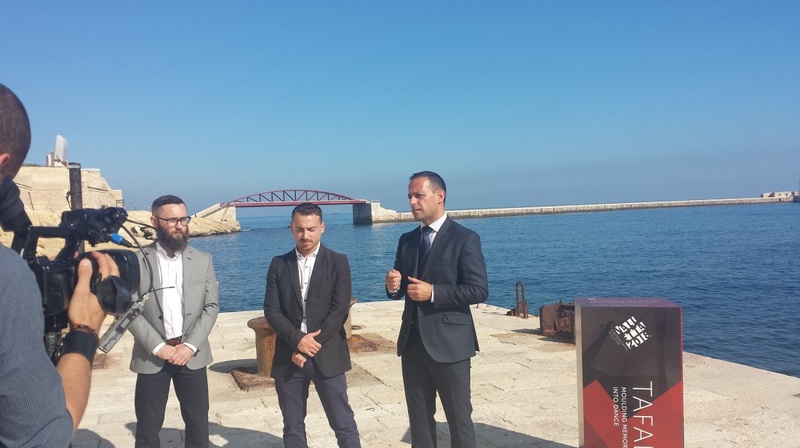 From right to left: Valletta 2018 Jason Micallef, Tafal videographer Cedric Vella and Tafal web designer Clint Tabone at this morning's Tafal launch in Valletta. A new short film series—Tafal—is reviving little-known maritime stories through an unexpected approach. Inspired by artefacts and stories from another Valletta 2018 Cultural Programme project (Qatt ma Ninsa),Tafal breathes new life into Malta’s forgotten past using the mediums of filmmaking, choreography and contemporary dance. This interdisciplinary project was launched today at tafal.org. Tafal was produced through collaboration between professionals from different cultural fields, including web designers, costume specialists, makeup artists, filmmakers, developers, historians, the Valletta 2018 Foundation, the ŻfinMalta Dance Ensemble, the Malta Maritime Museum and director Cedric Vella. The result was five short films that invite the viewer to explore the depths of the sea, board a world-travelling dgħajsa and go behind the curtain of a barber shop frequented by Royals. The inspiration for Tafal comes from a small selection of the hundreds of maritime objects and memories collected during the 2014 edition of Qatt ma Ninsa, hosted by the Malta Maritime Museum. From WWI mementos to the largest Roman anchor ever found, “the objects and the stories behind Tafal are part of Maltese history,” said director Cedric Vella. “The dancers selected the stories they felt they could relate to emotionally,” he added. Choreography and filming locations—including the National Pool and Marsamxett Harbour—were chosen to reflect these emotional reactions. It is this motivation that compelled collaborators to produce the most engaging works possible, not only to present contemporary dance to a wider audience but also to preserve the past by giving it a contemporary calling. The project is aptly named Tafal (in English: Clay) as the bodies of dancers, and the lens of the camera, mould stories into physical form. Travel back in time with us today at tafal.org.